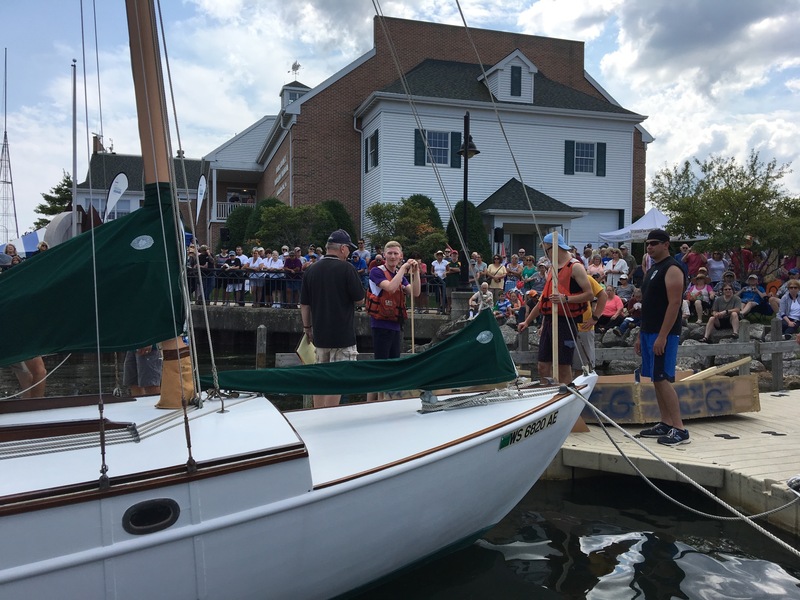 Now is the time to send in registrations for the Door County Classic and Wooden Boat Festival. August 11 and 12 with a special pre-event cruise on the 10th. The pre-event activity begins on Friday, August 10th at 11am with a tour of the museum's new Shipwrecks of Door County exhibit and a skippers meeting. After the meeting we'll take a cruise from the museum to the Sherwood Point Lighthouse on Green Bay passing Fincantieri Bay Shipbuilding on the way. We'll stop at the lighthouse for photos and then head back into Sturgeon Bay for lunch at the Sturgeon Bay Yacht Club ordering from the menu. After lunch we'll board the boats again and head down the ship channel to Lake Michigan and stop for another photo shoot at the Coast Guard Station there. Then it's back to the museum to tie up for the night. Later, registered skippers and their guest are welcome to a cocktail reception in the museum to talk about the day's cruise and each other's boats. The Festival itself opens Saturday morning at the museum and runs through Sunday afternoon. 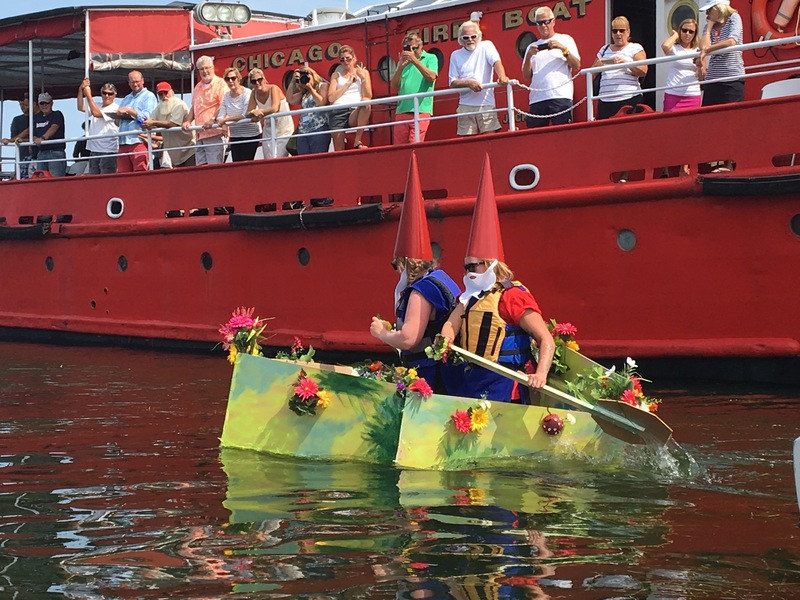 There is a street festival on Saturday adjacent to the museum and on Sunday everyone will get to enjoy the conclusion of this year's Sikaflex Challenge boatbuilding contest. There will be good food and drink and because the festival is located directly in downtown Sturgeon Bay, there are plenty of sights to explore. Registration is open until the morning of the festival. We only ask that boaters planning to be part of the pre-event cruise register before August 1st. Registration is $20. Last year we had a few fiberglass classics at the show and are hoping for many more this year. 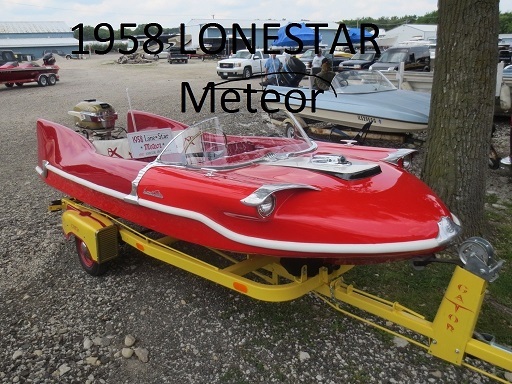 We have plenty of room for both trailered and in-water displays. We are also interested in antique outboards and classic fishing gear and can make room for pop-up tents and displays if anyone has one to share with the public. Thanks for the reminder. I have my registration and need to send it in soon. I will bring a different fiberglass boat this year. Hope the show keeps growing... it was awesome! Great to hear you'll be here. Can't wait to see which boat you bring this year. Thanks, too, for kind words about the festival. Here iare a few hints: it is a 1965 unrestored all original. One owner had it for 50 years and it still has the original interior seats that are not torn. Guess I had better wash and wax it so it looks decent since it is not a restored beauty like so many other amazing boats at the show. I could spend all day just looking at the other truly amazing boats that come to this show. I am hooked now! You bring out a good point. The Festival is sponsored by a museum. So history is important and boats don't have to be in perfect "show" condition to be welcome. Cleaned up is nice, though! Giving folks a chance to talk to owners about the boats and their stories is what makes these events so great. See you in a few weeks. ?Hey Bill, you're gunna like the lodge. Looks like I will have to miss this yearâs event. Life is calling another direction. Sorry guys. Hold down the fort and post a few pictures. 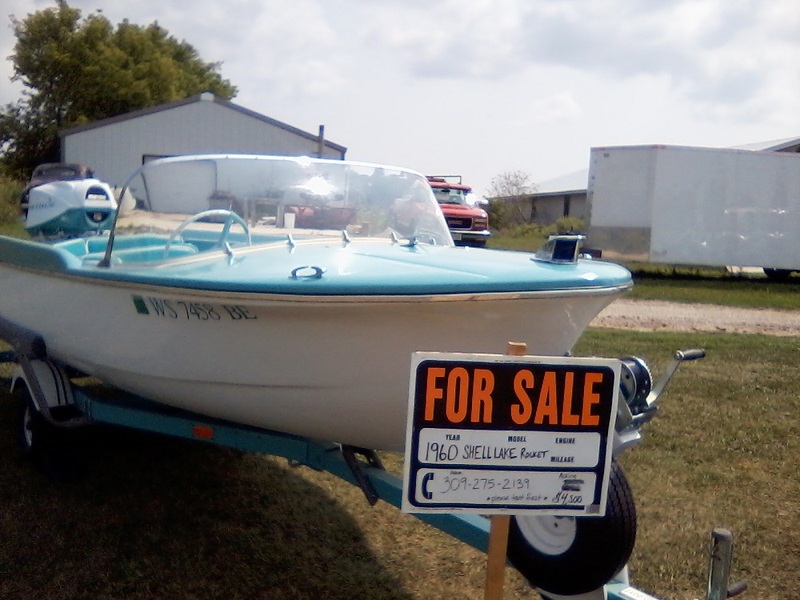 I was wanting to bring our 1955 fishing rig... next yearI guess. Going to miss you Mark. Two Marks not coming. I'll take pics. We'll miss you, Dr. Go, but look forward to seeing you and that 1955 next year. Registration is still open for the event, so check it out at the Festival website www.doorcountyclassicboatfestival.com . Next week is Maritime Week in Sturgeon Bay honoring the work of the US Coast Guard. The week is full of activities which you can find if you go the the Festival website. The boat show caps off the week. Saturday offers the street festival adjacent to the show and fireworks over the harbor that evening. Sunday brings the conclusion of the Sikaflex Challenge fast and dirty boatbuilding contest and race. It's fun. The weather report is looking good, too. Hope to see everyone there! We accept last-minute registrations right up to 9am Saturday! If I werenât needing to go the opposite direction, I would drop the rig off for the weekend. I had wanted to help with the DCMM wish list by bringing a boat load of our familiyâs 60 to 75 year old fishing gear and accessories. 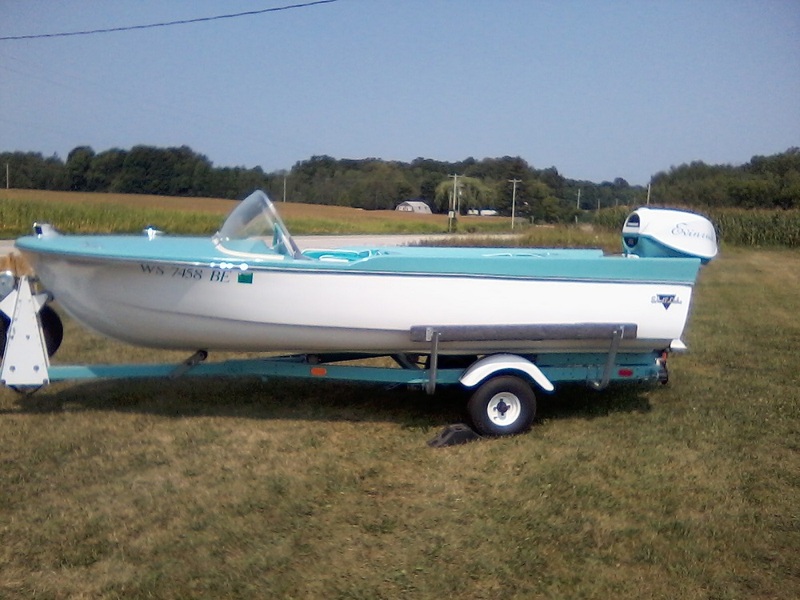 I wish I had the home made wooden boat my grandpa made from a popular mechanics set of plans that Dad first put the 1955 motor on... but the 1967 Starcraft should do ok. Maybe others can bring some of their old fishing gear to display. Have a great show. 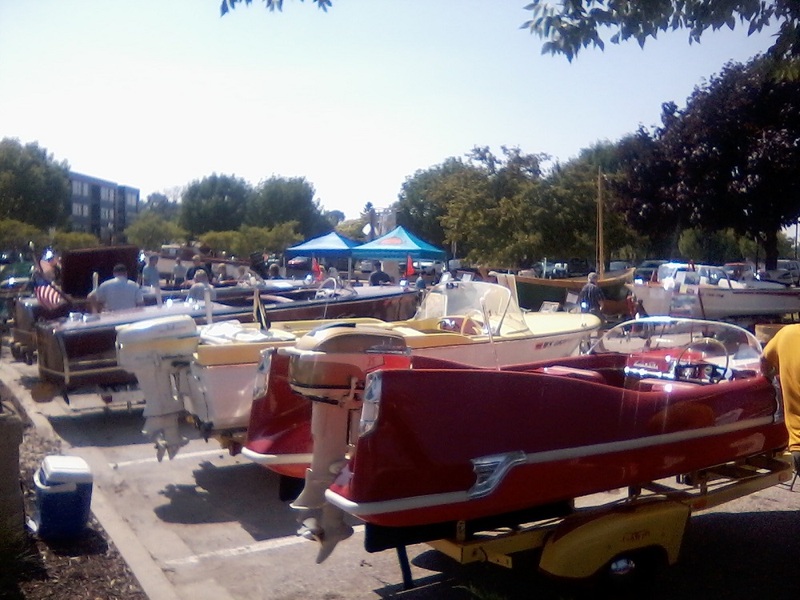 There will still be many boats to enjoy, so tell your friends to come out and enjoy. What a wonderful event and you cannot beat that amazing location!! Thanks for the kind words. I'm glad you mentioned our wish list. We'd really like to see more classic fishing gear, accessories, and outboard motors- the kind of stuff that reflects Wisconsin's boating past. Wisconsin-built boats, too. As a maritime museum sponsored show, history is really important to us. Take care! Bill, nope. 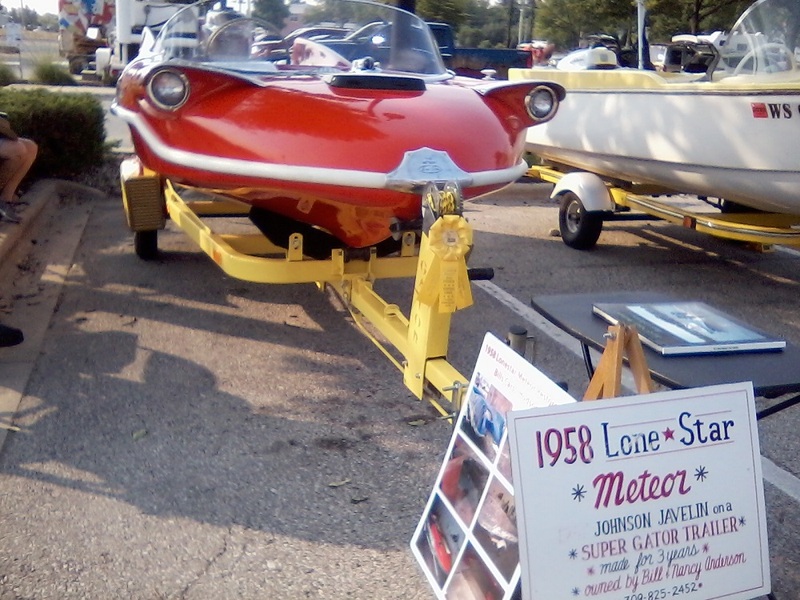 They usually have a small tent set up with boating item that were donated for sale to support the museum. Just planning on sitting around, eating brats/burgers and drinking beer. I plan on bringing the boat up on Friday afternoon, don't know about the cruise, depends on the weather et al. See if I can talk the admiral into going to the get together after. Bringing the Meteor will get you the peoples choice award for glass. Some pictures from the Door County Maritime Museum show. As predicted Bill got the people's choice award - fiberglass. No brainer there. Pretty classy! When he gets home he'll have to unstick the pages on his book of collections. People drooling while paging through it. See the yellow ribbon on the yellow trailer. Friday was an on the water cruise. I got to ride along in Mark and Mary Willis' Century Arabian. ACBS Glacier Lakes did a wonderful job the whole weekend. Thanks Roberta and crew. 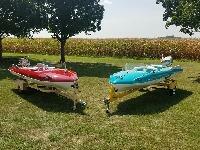 Bill and Andreas got their boats painted!!! - shock on Andreas face when I told him someone was painting his boat . I did drive farther up the Door peninsula and confirmed rumors that my last years entry was parked alongside the highway with a for sale sign on it. More on the water pictures later if anyone is interested. Kudos to Bill Fryman for all his efforts in organizing the event. Wouldn't be right to post that picture for everyone to see. Don't want to get the other Bill in any controversy. I did share it with Dr. Go though. Lesson learned by Dr.Go! If you donât show up ( yes I missed out) no chance for any accolades. I think we can get more boats there next year that are glass. The wooden ones are always a treat. Hope we can get a few more members to show up. I love the variety of the glass boats since designs over the years are all over the place. 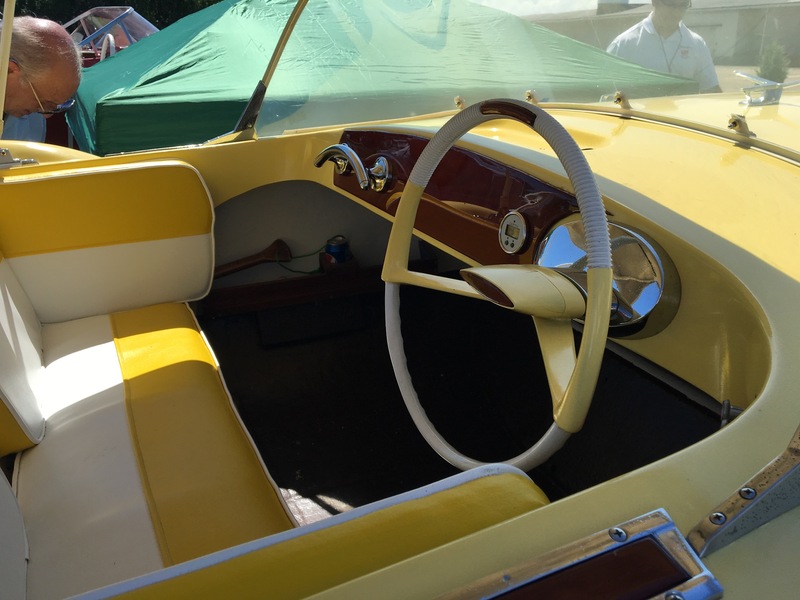 There's a whole new generation out there that has no idea of the style, colors, innovation that the boat builders of that era put on the market. We all have to get out the education paddle and put it to use. Problem is that there are sooo may of these shows popping up that it is difficult for owners to attend and display at them all.....unless you are an aficionado like Bill. The woodies are really nice but it seems today's generation are too busy with life to appreciate the craftmanship and pride of ownership that they display. There were two Chris Craft utilities that were for sale for the same reason I sold my Century. Nice boats but they don't want to see them sit on a trailer all summer.